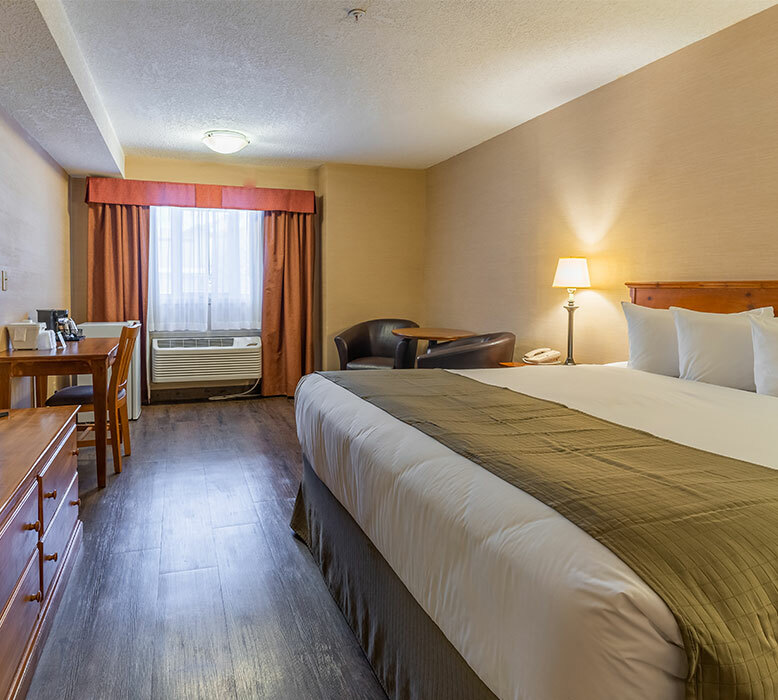 When it comes to hotels in Canmore, Alberta, Canada that offer charming hotel accommodation with convenient hotel room amenities, including a coffee and tea maker and complimentary Wi-Fi - the Canmore Inn & Suites is the perfect solution. 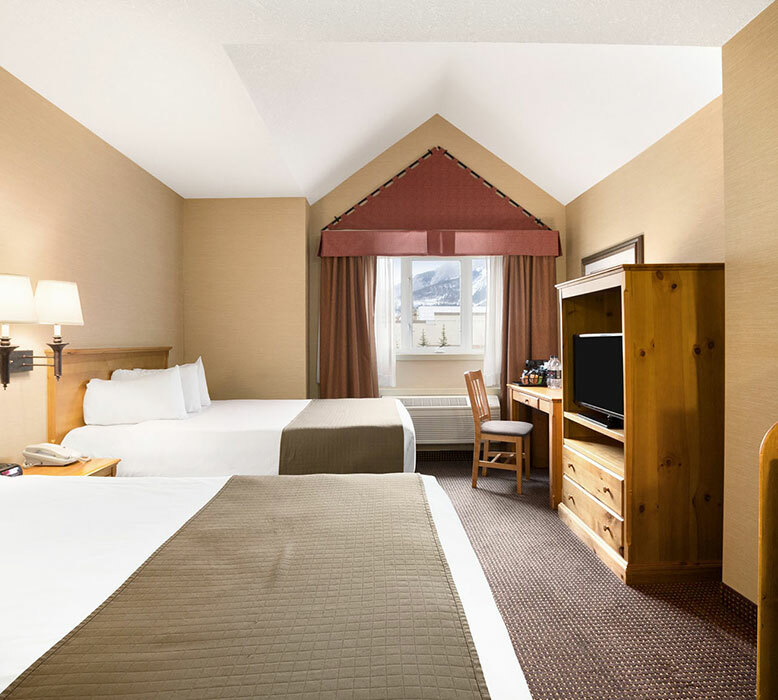 When you are looking for hotels near Canmore, choose the Canmore Inn & Suites every time. Our charming 242 square-foot railway or roadside view room features two cosy double-size beds, genuine alpine charm and amenities such as a 32" flat-screen TV, mini-fridge, microwave, writing desk, and a bathroom with walk-in shower. Additional services such as a complimentary daily newspaper, in-room safe, iron and ironing board and hairdryer ensure extra convenience. 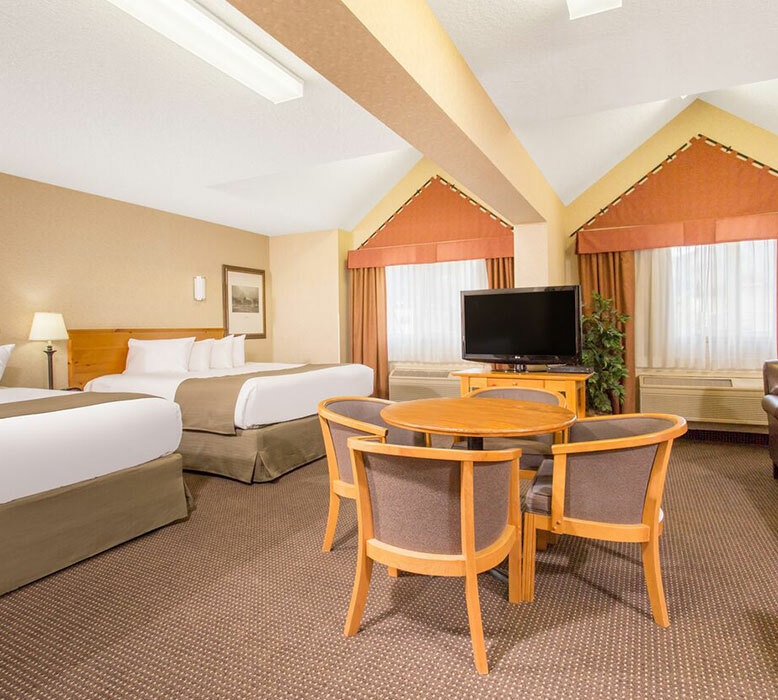 Our Economy Queen room provides guests with a budget-friendly accommodation option. This room features 242 square-feet of space, as well as a cosy queen-size bed, railway views, 32" flat-screen TV, mini-fridge, microwave, and full bathroom with a bathtub and shower combination. Additional services such as a complimentary daily newspaper, in-room safe, iron and ironing board and hairdryer ensure extra convenience. Offering roadside or railway views, this 336 square-foot room offers a little more space along with two queen-size beds and deluxe amenities such as a 42" flat-screen TV, writing desks, microwaves, mini-fridges and full bathroom with bathtub and shower combination. Additional services such as a complimentary daily newspaper, in-room safe, iron and ironing board and hairdryer ensure extra convenience. 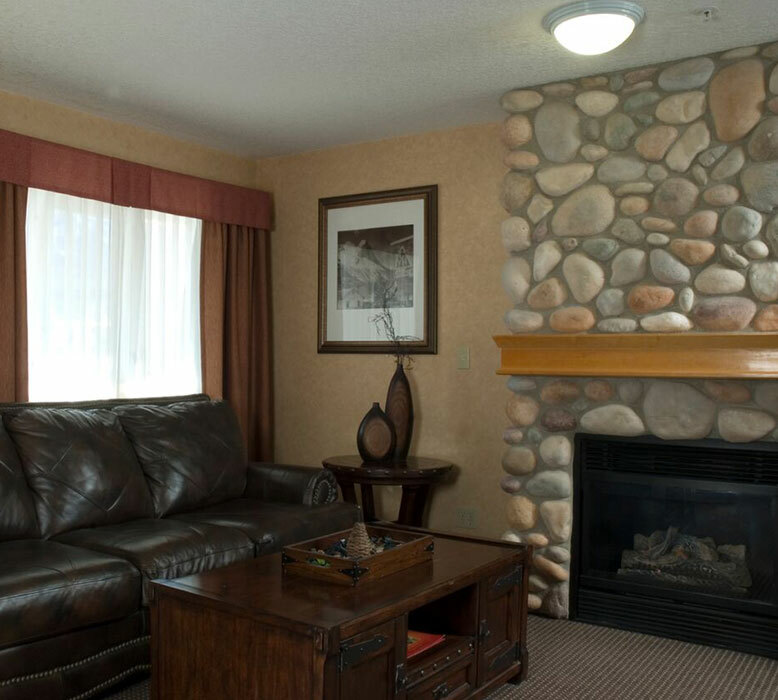 The Canmore Inn & Suites wants all of our guests to be completely comfortable when they stay with us. 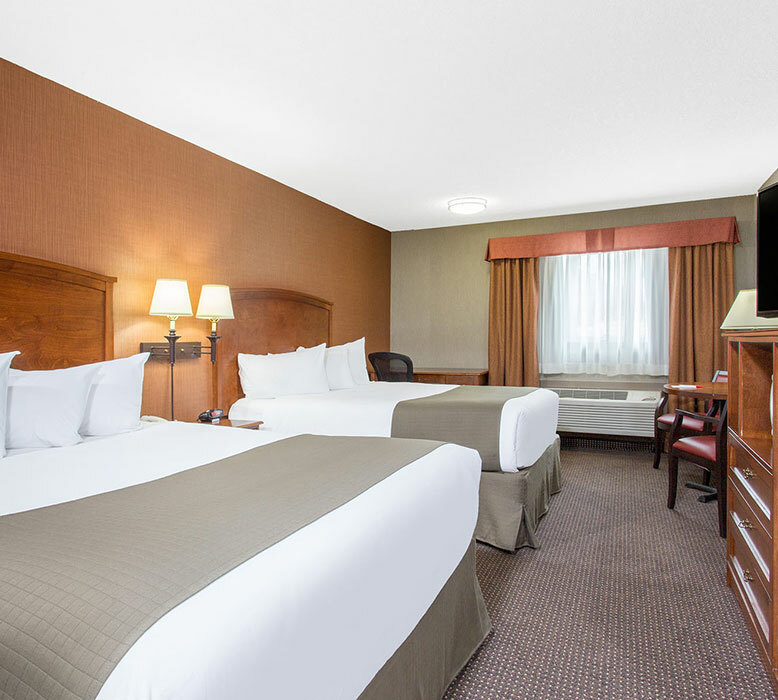 Our 336 square-foot accessible room is wheelchair accessible and has two double beds, as well as grab bars in the full bathroom. 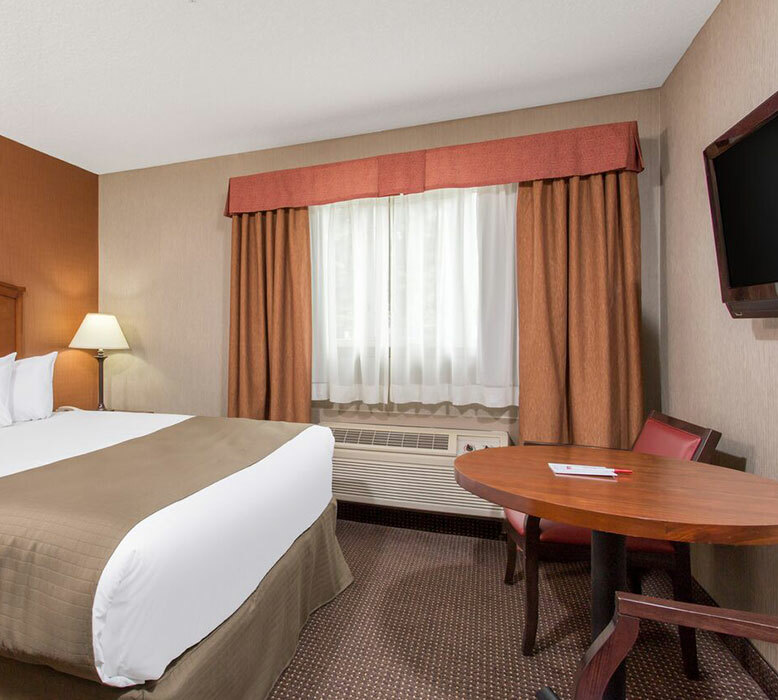 Standard room amenities include a mini-fridge, microwave, flat-screen TV and more. Additional services such as a complimentary daily newspaper, in-room safe, iron and ironing board and hairdryer ensure extra convenience. 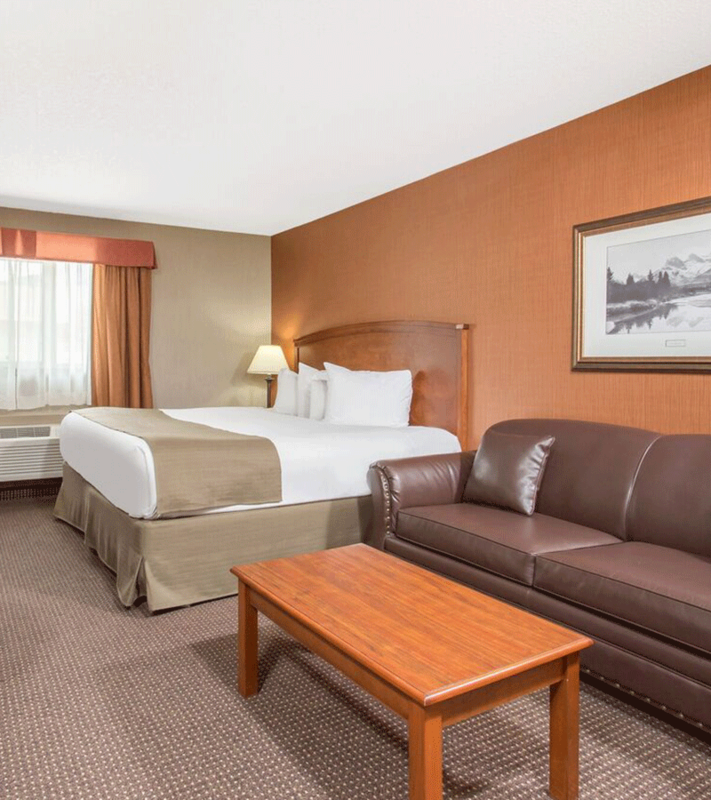 With 336 square-feet of space, roadside views and a comfortable queen-size bed, this room offers guests an economical option when staying in Canmore. There is a full bathroom with bathtub and shower combination, as well as a 42" flat-screen TV, mini-fridge, writing desk, chair, microwave, a sitting area and more. Additional services such as a complimentary daily newspaper, in-room safe, iron and ironing board and hairdryer ensure extra convenience. 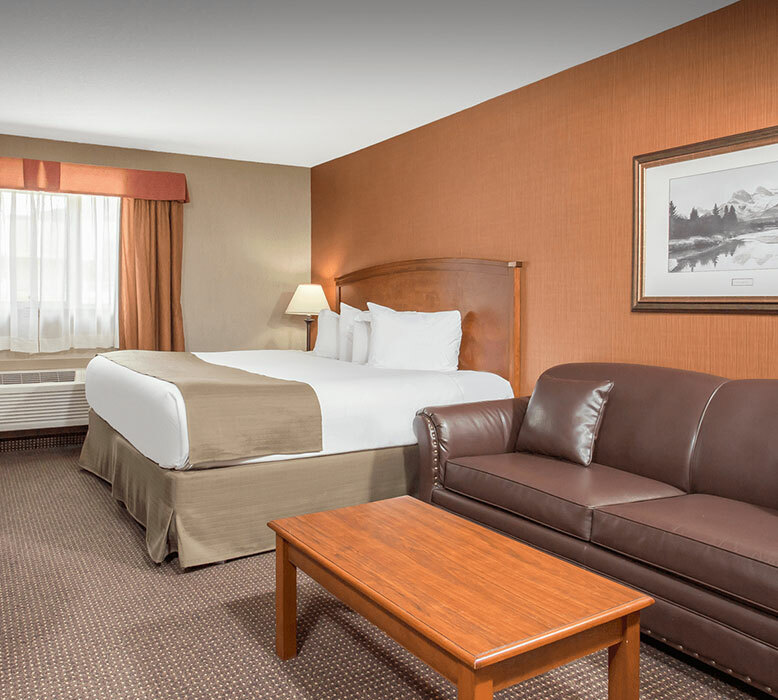 Our 336 square-foot railroad view Efficiency King Room is tastefully decorated with alpine-inspired furnishings and comes with a plush king-size bed and a sofa bed. 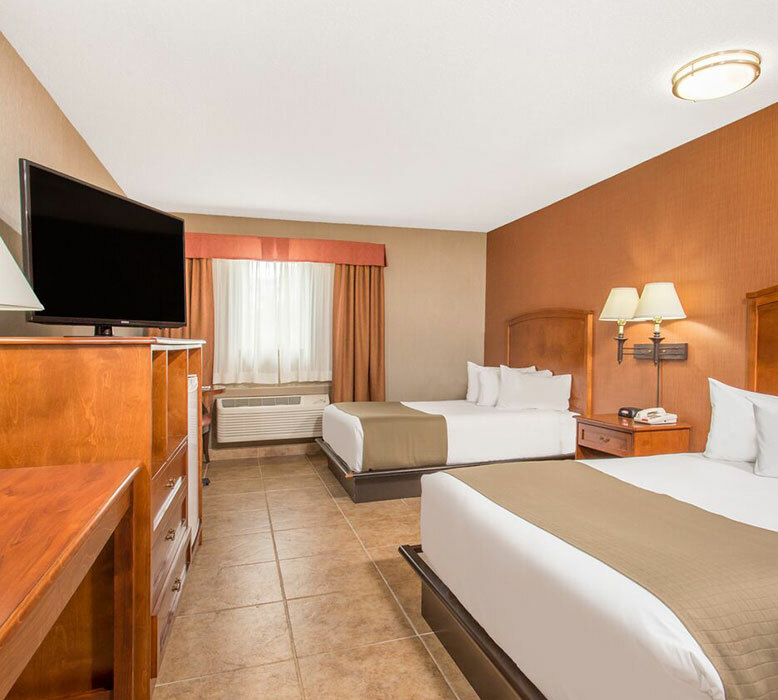 Complete with a 42" flat-screen TV and kitchenette that includes a microwave, mini-fridge and more, this room is perfect for small families and those requiring more space. Additional services such as a complimentary daily newspaper, in-room safe, iron and ironing board and hairdryer ensure extra convenience. This beautiful oversized suite features room for up to six guests and has one king bed, one queen bed, a sofa bed and two full bathrooms, one with a jetted tub. 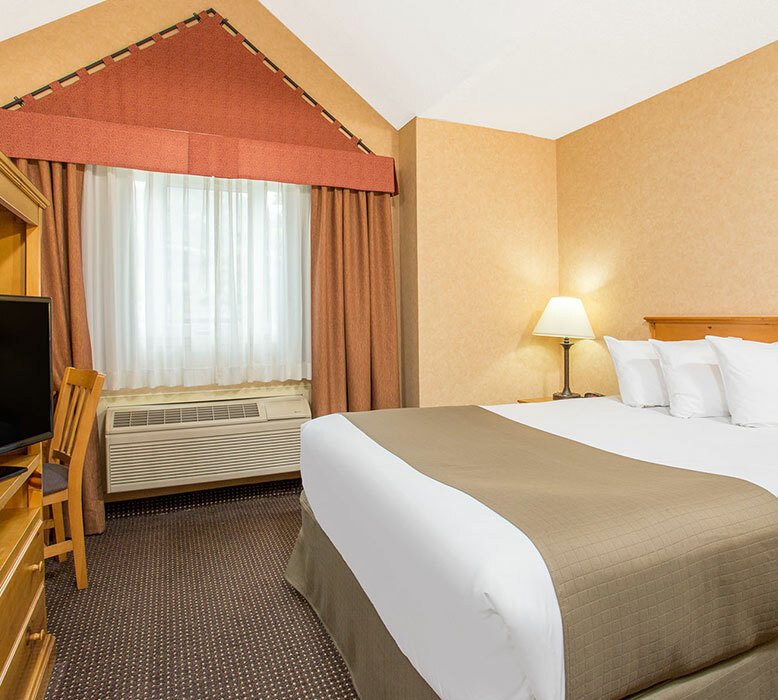 Deluxe amenities include free high-speed Wi-Fi, a flat-screen TV, and a kitchenette with a mini-fridge and microwave. Additional services such as a complimentary daily newspaper, in-room safe, iron and ironing board and hairdryer ensure extra convenience. Ideal for young families, teams and small groups, this spacious open-concept suite features two king beds, a sofa bed, two full bathrooms, and a kitchenette with a mini-fridge and microwave. Additional services such as a complimentary daily newspaper, in-room safe, iron and ironing board and hairdryer ensure extra convenience. For those looking for a little more elegance, our attractive and spacious Pullman Suite offers a plush king-size bed, a full bathroom with a jetted tub, a cosy separate sitting area with a fireplace, as well as a kitchenette with a mini-fridge and microwave. 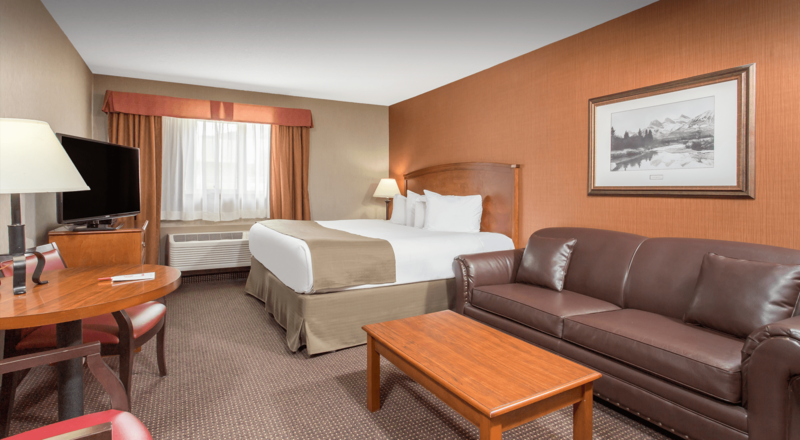 This is the perfect suite to enjoy some genuine time with that special person in your life. Please inquire about our Romance Package if you are planning a romantic escape to Canmore.